Tips and tools to streamline the study process. University study requires a lot of reading of sometimes unfamiliar and challenging material. Fortunately, there are lots of strategies you can use to maximise your reading time and get the information to "stick". Explore the tabs below to find a variety of approaches you can use for reading fiction, journal articles, and textbooks. Are you concerned about the amount of reading you have to do at university? 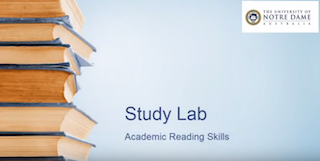 Learn how to read both quickly and effectively with the help of this video. Survey: before you read, survey the text: the title, headings, sub-headings, the introduction, conclusion, summary; captions, charts, graphs, maps. Question: turn the headings, sub-headings into questions you think the section should answer. Read: read the sections with your questions in mind. Look for answers. Make up new questions if necessary. Recite/Recall: after each section, stop and think back to your questions. Can you answer them from memory? If not, look back at the text. Review: once you have finished the whole chapter/article, go back over all the questions formed from all the headings. Can you still answer them? If not, go back and refresh your memory (Robinson, 1978). Read the table of contents or chapter overview to learn the main divisions of ideas. Glance through the main headings in each chapter just to see a word or two. Read the headings of charts and tables. Read the entire introductory paragraph and then the first and last sentence only of each following paragraph. For each paragraph, read only the first few words of each sentence or to locate the main idea. Stop and quickly read the sentences containing keywords indicated in boldface or italics. When you think you have found something significant, stop to read the entire sentence to make sure. Then go on the same way. Resist the temptation to stop to read details you don't need. Read chapter summaries when provided. Know what you're looking for. Decide on a few key words or phrases as search terms. Look for only one keyword at a time. Let your eyes float rapidly down the page until you find the word or phrase you want. When your eye catches one of your keywords, read the surrounding material carefully. Is your textbook just a mass of meaningless highlights? Find ways to annotate effectively. You might understand how to read a textbook, but what about fiction and non-fiction? Find ways to read these sources more efficiently. An academic describes the questions you should be asking when reading a scientific journal article. Robinson, F. P. (1978). Effective study (6th ed.). New York, NY: Harper & Row.